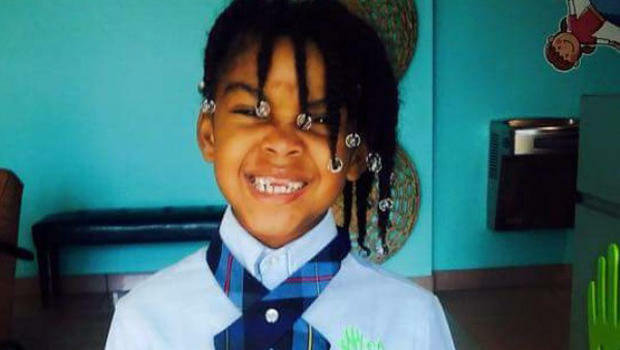 BOYNTON BEACH, Fla. -- An 8-year-old Florida girl died more than four months after she was injured while drinking boiling water through a straw on a dare. CBS West Palm Beach affiliate WPEC-TV reports Ki'ari Pope started having trouble breathing on the night of July 30. She told her mother's boyfriend, who called 911. Ki'ari then lost consciousness, according to the Department of Children and Families. She was taken to a hospital, where she died 40 minutes later. Marquisia Bonner, the child's 22-year-old mother, told the Sun Sentinel that Ki'ari had suffered complications since March when she took the dare from her cousin. Ki'ari's family told WPEC-TV that the girl and her cousins watched several YouTube videos about the Hot Water Challenge, where someone appeared to drink boiling water from a straw. Ki'ari Pope is seen in a photo her family provided to CBS affiliate WPEC-TV in West Palm Beach, Florida. Ki'ari had emergency surgery on her windpipe to clear scar tissue. Her mother says a tracheotomy left her with trouble breathing and talking. The Department of Children and Families is investigating the death, WPEC-TV reports. The department said it received multiple reports involving the girl and her family between 2009 and 2017. Ki'ari's aunt Diane Johnson told WPEC-TV that parents should monitor what their children watch. "Parents, talk to your kids about these challenges," she said. "Don't just let it go by and just give them your phone and let them be. No. Watch what they're watching."